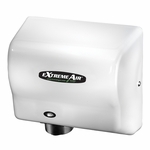 Bobrick B-273 Single Roll Toilet Tissue Dispenser with Controlled Delivery. Heavy-duty cast aluminum, satin-finish. High-impact plastic spindles have concealed locking device; theft-resistant. Holds single roll up to 6" (150mm) dia. (2000 sheets). Controlled delivery.